No matter what, as time goes by, it is human nature for our memories to gradually fade out all the bad bits and clinically store the good bits. When it comes to my two and a half years working in a couple of my local fish shops, I strangely find it hard to recall the endless chores of water changes, measuring tonnes of garishly coloured gravel into 10lb bags and polishing miles of glass. I find it very easy to remember most of the fish and especially those I met for the first time. So it was with my initial encounter with this month's species, the vulture catfish, Calophysus macropterus. Amongst an order of several specimen catfish species I had not seen before was a very interesting import we got almost by chance. It was in a box utilising maximum available space mostly taken up by a good-sized Brachyplatystoma juruense. When large specimen fish are exported, the price is high as it is governed by what you can fit in the box. You can, to a degree, off set this with some artful packaging but it is the that crucial skill of a good exporter to know what they can fit into a box and what is pushing it. At three inches long, you could be forgiven for mistaking the vulture catfish for several other pimelodids but I did not. I could see I was looking at a hunter. Everyone else was off getting excited about the bigger, showier catfish that had come in, but I remember with crystal clarity only my releasing the Vulture cat, probably because I, being very much the shop junior, was not entrusted with the big guys (fish or customers). Pimelodids freshly imported from overseas and released into a largish tank can often further distress their financially depleted keepers by general sulking around, going off their food or skin shedding. None of this from the young vulture as it took off and started circling - its equivalent thereof anyway - just cruising around with barbels inquisitively splayed wide. What was I to do but ensure our new charge was fed? A couple of lumps of frozen bloodworm were tossed in and immediately dispatched. I was impressed: this was a hardy fish. I took to having nurtured a special interest in the fish; i and in the four or maybe five months it was in the shop before it was soldits sale, I was able to observe its habits and behaviours, likes and dislikes. As larger pimelodids go, this fish isn't a giant and so can be considered for captivity in large aquaria. Something like a 6x2x2 foot tank would be a minimum, but this fish doesn't need as much space as some of the larger catfishes and you can grow it out in smaller tanks. That said, you're dealing with a pimelodid that is less prone to cycles of feast and famine than others; the load on the filter of a smaller tank will be heavy and you should have a backup filter readylly for keeping these kinds of fishes. It'll eat anything. "My" vulture more than doubled in size in the time we had, it was active during the day and, barring maybe a couple of hours down time, didn't become inactive after feeding. While a dangerous fish to know, it also seemed remarkably peaceful with its tanks mates, though I suspect that was only because it was kept well fed. Of the various fish it was kept with, larger Tilapia seemed to be bestmost appropriate to me. A big pim pictus one of my colleagues remarked, I suspected then, and know now, that is not where the similarity ends. These fish do appear to live together in the wild. Several accounts exist in the literature of these fish being found in areas where waste products such as offal are dumped into the river. In my own experience this is a species that is often caught on simple hook and line by fishermen; its curiosity, keen senses and blind desire for an easy meal combineing to make it a common catch. I suspect this common species doesn't often make it to our local fish stores very often because as they are so voracious in exporters' holding facilities and, in relation to other "kittens" (small pims that grow large), Vultures are not as exotic looking. T - this is a shame because vulture cats are attractive as young and especially adult fish, have a lot of character and don't grow as big as those other cute kittens. So, thinking about setting up that big show tank with some big old American cichlids (and I can't talk you into a shoal of 500 Corydoras? The vulture cat and maybe a big common pleco or similar is a pretty good addition. Identification Body somewhat elongate and head broad. Eyes superior. Barbels flattened with maxillary pair extending past the end of the adipose fin. First dorsal and pectoral fin rays are 'soft'. Number of spots on the body varies greatly between populations. General Remarks This fish has at times been placed in its own family, the Calophysidae. Although it externally looks much like other pimelodids its unique dentition, different positioning of the fins from other pimelodids, and reduced and encased swim bladder make it a distant relative of the other pimelodids. Distribution Common in shallow waters in the Amazon near riverbanks where it is often seen in concentrations near human populations scavenging food amongst human offal. Feeding An adaptable carnivore as the common name, 'vulture catfish' applies. Furniture Comfortable in almost any environment, including sturdy planted aquaria, provided it has sufficient hiding places. Compatibility A true scavenger that is also a vicious predator. Its unique dentition allows it to bite other fishes and remove chunks of flesh. Often attacks the catch of fishermen while they are hooked or netted. 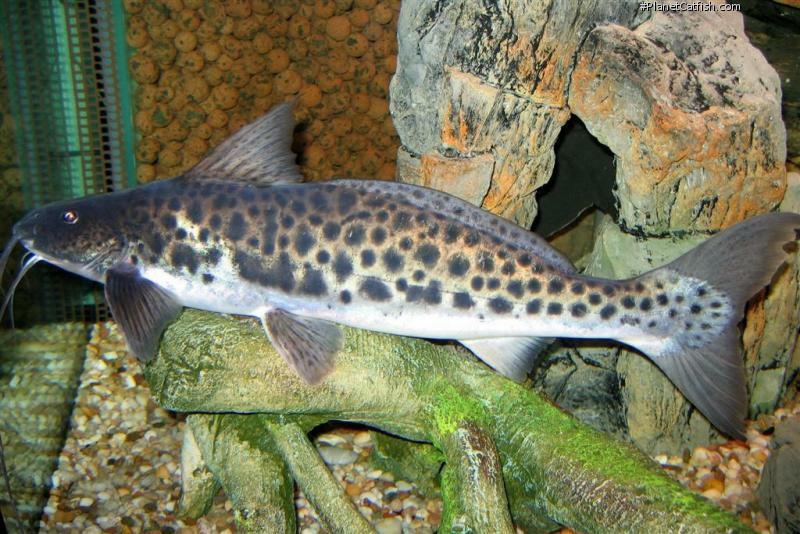 This ability has given the name bagre matchete (machete catfish) in Venezuela and Colombia. They are so vicious in their attacks that they sometimes stay attached even when their prey is removed from the water. Tankmates should be chosen with great care. While it appears this fish mainly attacks wounded fishes, it certainly has the ability to rip any tankmate to shreds should it desire to do so. Suggested Tankmates Armored loricariids and doradids, larger fish such as cichlids. Romano B. (1985) Peces de Aqua Dulce de Venezuela Vol. I. Editorial Biosfera. Ros, Wolfgang and Schmidt, Jakob (2008): Calophysus macropterus: Ein "Hai" im Süßwasseraquarium: D. Aqu. u. Terr. Z. (Datz) 61 (4): 16-18.